Monitors heart rate, blood pressure and sleep to let you know your health better. 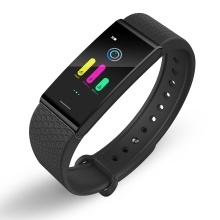 Tracks sports activities like steps, distance, calories burned. Calls, messages and app vibration notifications. Other functions: IP68 waterproof, find phone, sedentary reminder, stopwatch. Built-in charging interface for convenient charging from USB-port device, no cable required. Lightweight and adjustable, perfect gift for both men, women, kids.